Fina Strazza backstage at "A Christmas Melody" at Kilgour Elementary School. When Mariah Carey needed a child actress to sing her “Oh Santa” in “A Christmas Melody,” she signed Broadway’s “Matilda: The Musical” star. Nine-year-old Fina Strazza had recently finished an 11-month run in New York’s Shubert Theater when she got the call for the Hallmark Channel movie Carey is appearing in and directing in Cincinnati this month. Fina, in her first major TV role, plays Emily Parson, daughter of a single mother (Lacey Chabert) who recently moved back home to fictional Silver Lake. Carey, who appears as the diva PTA president, rewrote lyrics to her 2010 “Oh Santa” hit for Fina to sing at the Silver Lake Elementary Snowflake Pageant. The Grammy-winning pop star isn’t the biggest icon Fina met this year. When Barack Obama attended a fund-raiser at her neighbor’s residence in New York City last spring, the president visited her too. “My sister taped a sign on the door that said, ‘Please knock!’ ” Fina said. A music video of Fina’s “Oh Santa” is in the works by “A Christmas Melody” executive producers Brad Krevoy and Jonathan Axelrod. “It’s going to be a sensation around America,” said Krevoy, who produced Nicollette Sheridan’s “The Christmas Spirit” in Lebanon two years ago for the Hallmark Channel. Fina starred on Broadway in “Matilda: The Musical” from August 2014 through July. She made her movie debut last year in “A Little Game” with Janeane Garofalo, Ralph Macchio, Rachel Dratch, Olympia Dukakis and F. Murray Abraham. Unlike the immediate gratification from a Broadway play, movies stars have to wait months to see their films. For this little girl, who loved playing in the Washington Park playground while in town, can’t wait until the week before Christmas. That’s when “A Christmas Melody” premieres 8 p.m. Saturday, Dec. 19, on the Hallmark Channel. 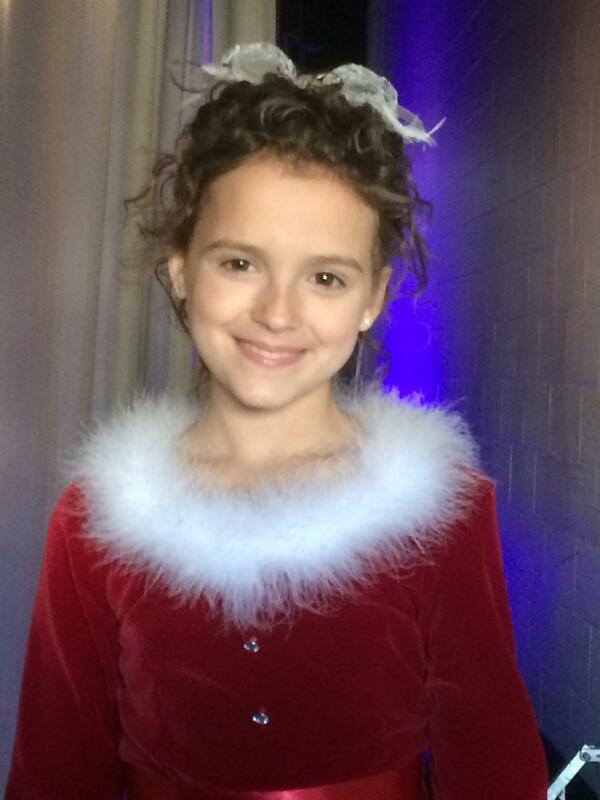 Filming wraps Thursday on "A Christmas Melody." 1:30 P.M. UPDATE MONDAY OCT. 19: Be on the lookout for Kathy Najimy. She’s also in Mariah Carey’s “A Christmas Melody” Hallmark Channel movie. She plays Aunt Sarah to Kristen (Lacey Chabert). Sarah owns the diner where Kristen often goes to eat.